Junior Cam Shurig. Photo courtesy of McIntyre Imaging. 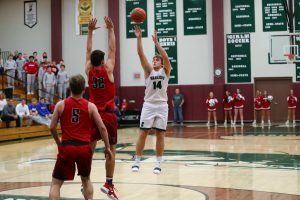 The Boys Basketball team (2-0) kicked off their home schedule for 2018-19 as well as Circle City Conference play on Saturday night, battling to a 61-59 win over Roncalli HS (1-2). Junior Cameron Shurig hit a 17-footer for the game-winning shot off of an inbounds play to decide the game. The win was the first conference win in program history. The game started as a back-and-forth affair in the opening quarter. After CCHS jumped out to a 5-0 lead, the Rebels battled back to a score after the first eight minutes. Covenant pulled ahead with a 24-point second quarter, shutting RHS out for the final 4+ minutes of the quarter. Junior Noah Hedrick helped key the run, scoring 15 of hist team-high 20 points in the quarter. The Warriors took a 35-25 advantage into halftime. Roncalli made a run of their own in the third quarter, outscoring CCHS in the frame for a 42-42 tie heading into the final quarter. Covenant got out to a five point lead with three minutes remaining, but could not pull away. Roncalli tied it up at 59-59 on a 15-foot jump shot by Sophomore Johnny Brunk, before Shurig hit the game-winner on the game’s final possession. Shurig ended the game with 13 points and 3 assists. Hedrick had 3 rebounds and steal to go with his 20 points. Roncalli’s Junior Jacob Denny poured in a game-high 27 points to lead the Rebels. The Warriors will be back on Andrew Smith Court on Wednesday night, as they host sectional opponent North Putnam HS in a JV/V doubleheader at 6:00/7:30 pm. The varsity game will once again be webcast on Indiana SRN, beginning with the pregame show at 7:15pm. Roncalli – The varsity boys basketball team lost to Covenant Christian by a score of 61-59. Jacob Denney led the Rebels with a career high 26 points while Aidan Looney added 10. Looney and Daniel Asher each had 6 rebounds while Johnny Brunk had 6 assists.